It's mid July..one and half months since the schools reopened - the usual routine of alarms ringing, packing lunch/snack boxes, rushing to catch the school bus and above all, tests,activities, home work - all these have reclaimed their rightful place in our lives. The time is 8.45 and I've just cleared up the remnants of the morning "hungama" (commotion) and enjoying a hot cup of tea. I've been planning on writing this post for a few weeks,but kept postponing.Now is the time!!! During the summer vacations, we happened to tour Pune,Shirdi and Aurangabad. It was not a planned tour,it just happened because of a surprise invite by my DH's uncle and aunt who live in Pune. One of DH's cousins and her family were visiting them and they invited us to join them. 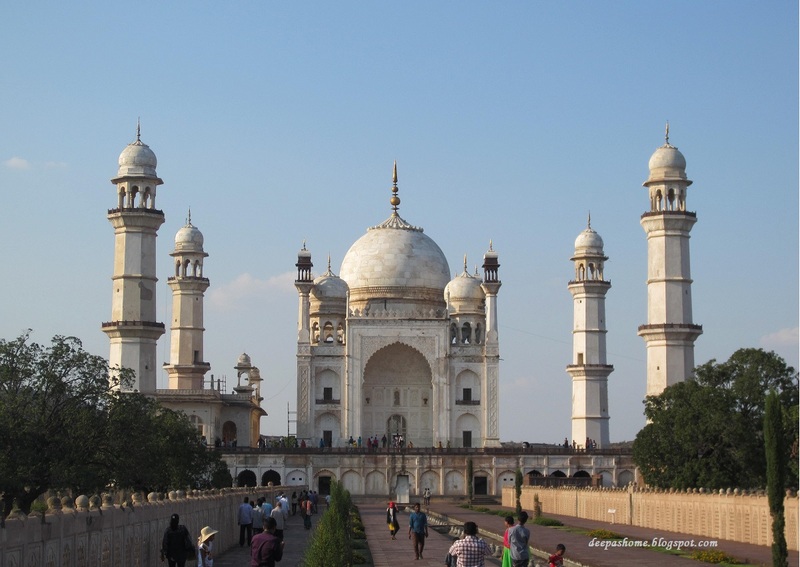 A visit to Aurangabad is not complete without "Bibi ka Maqbara"(Tomb of the Lady). 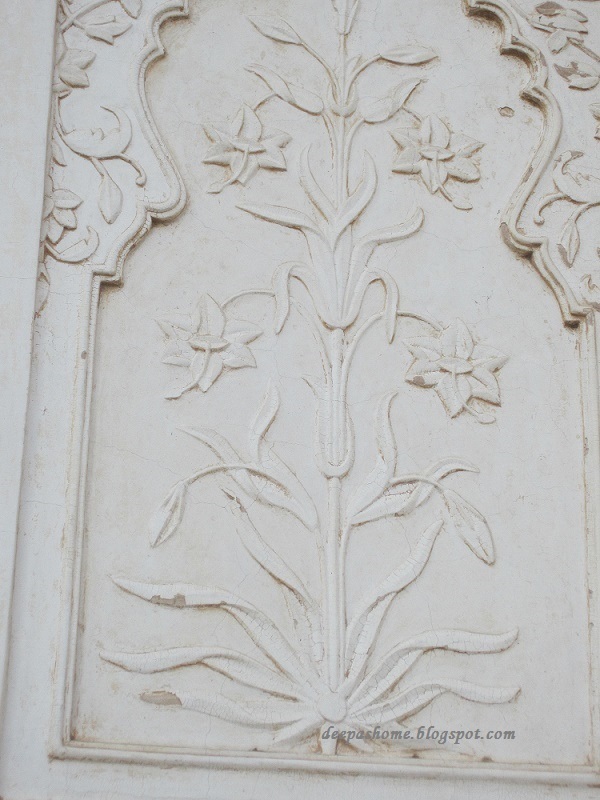 This monument was commissioned by Mughal Emperor Aurangazeb in his wife's memory after her death in 1657. 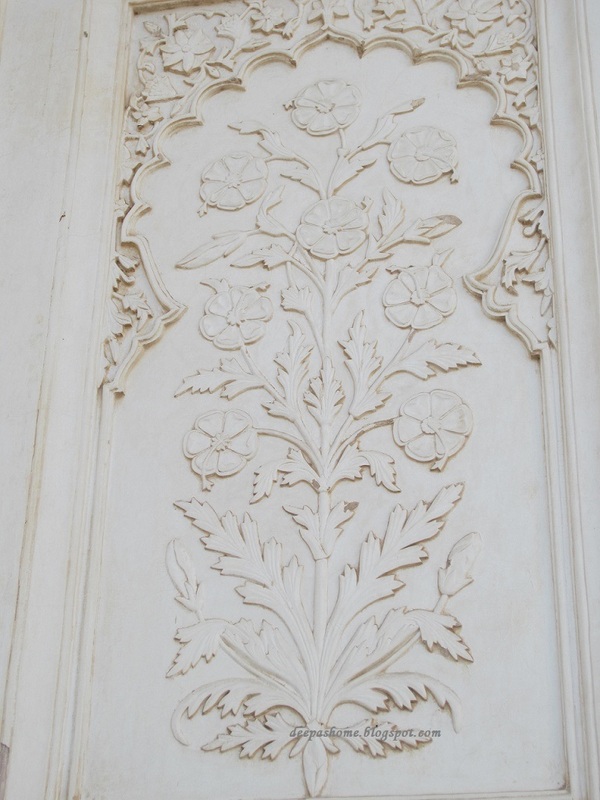 It bears a striking resemblance to the Taj Mahal and is also known as the Taj of the Deccan. 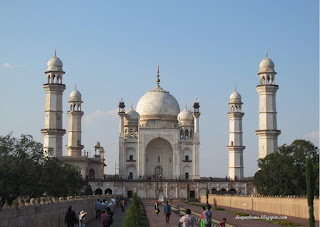 People say that it is a cheap copy of the Taj Mahal - but the moment my eyes fell on it - I was floored. Here's a close up of the rose. All I could think of was how these would look when embroidered? 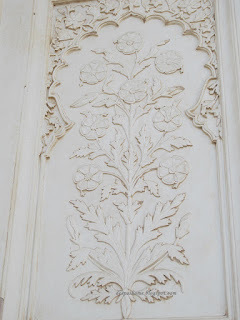 In fact, these carvings did remind me of some style - Crewel embroidery,perhaps? 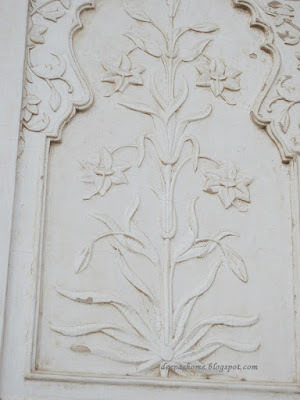 We could see such carvings all around. The place is truly a treat for history lovers and artists. 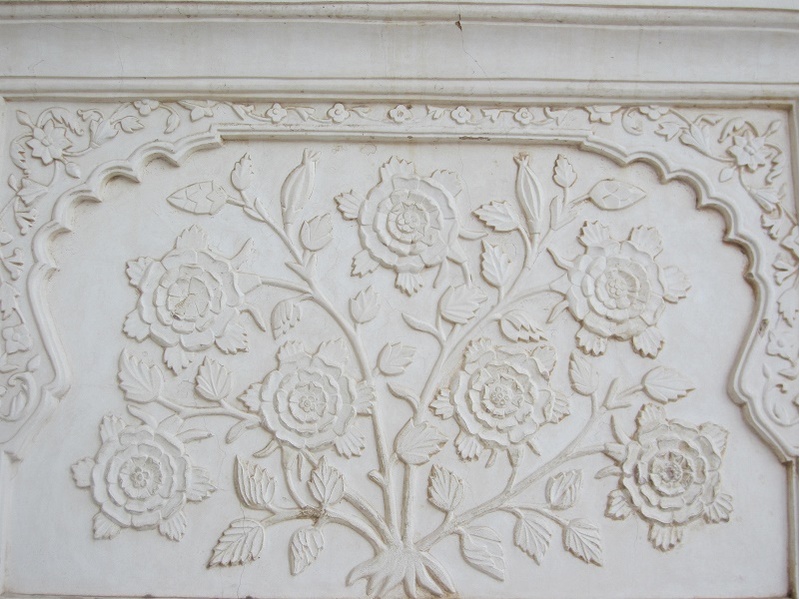 And then when we went inside- there she was,resting in peace - "Dilras Banu Begum" - that was her name- the wife of one of the most powerful & controversial Mughal Emperors of India. A lovely reportage Deepa, thank you so much . I have not been to Auringbad (yet) but I I'll put this city on my 'to see' list. 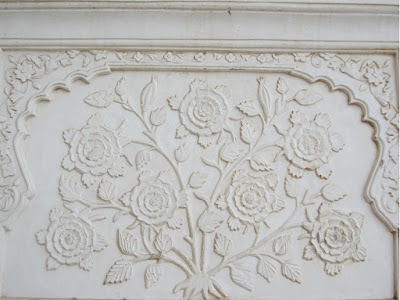 And of course I am curious to see how you will interpret in embroidery the amazing marble sculptures. Indeed, Deepa. It would be fantastic to bring these designs to life via Embroidery. Happy Embroidering! I am starting a new project, working on a Kurta again. oh yes deepa, you should get embroidering!! I have heard that crewel embroidery was inspired by the increasing contact between India and Europe at the time, as were some of the printed fabric designs, which were referred to as "chintz", but have more than a passing similarity! How funny that you're children have gone back to school, but in England our children are just starting the summer break! You have very kindly left some nice comments on my blog and I would love to reply to you, but you are a no-reply blogger so I can't. I think this is caused by Google+ but is easy to fix. If you google it, there are plenty of tutorials to show you what to do to fix it. I hadn't thought of using architecture like this as inspiration - but this looks like a great idea! Now to go find some good designs around here! Thanks for sharing. after long time im here in this page. a visit to taj mahal is on my bucket list. 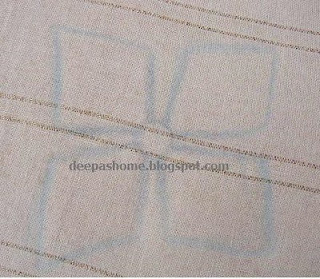 are u planning to embroider those? The patterns and details are so beautiful! It would look great when embroidered too. Thanks for sharing!